Often clients tell me that they aren’t the biggest fan of their double chin and wish there was a way (without surgery) to make it disappear. Well, I can show you a quick trick with colour that can make a huge difference in how obvious it appears. Watch this short video. Magic! I must remember that, thanks. This is my biggest source for unhappiness and I´m so impressed by that video you made! This site, I just discovered it, is like a goldmine of useful information that no one managed to explain to me before. I never felt right about being a pear, as I was always told, and realize now that I´m a perfect 8. With your help, I´ll be able to edit my wardrobe and find my “heroes”! This is the best video I’ve seen. It really drives home the point. Thanks so much! Thanks for the dramatic demo. No black near my face ever again! Thank you very much, Imogen. My subscription to your blog is always a welcome sight in my Inbox and like many others, I explore many more articles! As Diversity says, the video drives home the point. If one doesn’t believe it, one only has to do it to see it’s true. 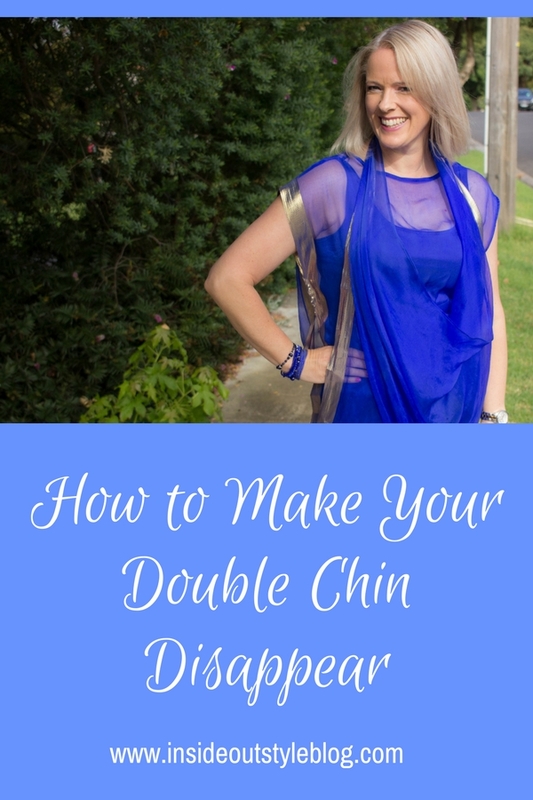 May I know if this effect on double chins of using lighter colours near the face can be reconciled with some make-up articles that recommend using a darker foundation underneath the chin for double chins? Wearing a dark coloured top near your face puts shadows all over your face and will add jowls, extra lines around mouth and under eye bags. The shadowing you can do with makeup is much more subtle, and you have control about how you use it to contour.